Dr. Sharad Sharma is an Associate Professor in the Department of Computer Science at the Bowie State University. He has received Ph.D. in Computer Engineering from Wayne State University, Detroit, MI in 2006, M.S. from University of Michigan, Ann Arbor, MI in 2003. He has won the "2018 USM (University System of Maryland) Board of Regents' Faculty Award for Excellence in Scholarship and Research. He has also won the "Outstanding Researcher Award" in year 2013, "Outstanding Faculty Award" in year 2012, "Outstanding Researcher Award" in year 2011, "Outstanding Publication Award" in year 2010, and "Outstanding Young Faculty Award" in year 2009 at College of Arts and Science in the Bowie State University. 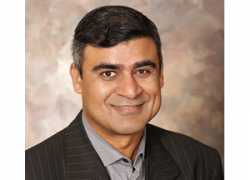 Dr. Sharma’s research specialization includes modeling and simulation of emergency response and decision making, evacuation scenarios, software engineering, multi-agent systems, Virtual Reality, Augmented Reality, gaming and neural network. He is involved in developing new data and visualization methods for course of action planning, visualization, training, and assessment. He is also exploring socio-cultural issues in Collaborative Virtual Environments (CVE) for emergency response and decision making in dense urban environments. He has published more than 70 peer-reviewed conference and journal articles in top conferences including IEEE-ICMLA, SPIE, SEDE, IEEE/ACM-CTS, IEEE-CSCI, IEEE-SSCI, IEEE SoutheastCon, Elsevier-Future Generation Computer Systems (FGCS), and IEEE Transactions on Aerospace and Electronic Systems. Dr. Sharma is the Director of the Virtual Reality Laboratory at the Bowie State University. The current projects in the VR Laboratory focus on modeling and simulation of multi-agent systems (MAS) and multi-user virtual reality (MUVR) environments for emergency response and decision making strategies. The lab also focuses on using virtual reality and augmented reality as tool for learning, training, and education. The current projects in the Virtual Reality Laboratory focus on performing virtual evacuation drills in Multi‐User Virtual Reality (MUVR) environments such as school bus, airplane, subway, building, megacity, etc. He has acquired several research grants from various funding agencies such a Department of Defense, Department of Homeland Security, Army Research Laboratory, and the National Science Foundation. He was also the Program Chair, for the Twenty Sixth International Conference on Software Engineering and Data Engineering (SEDE 2017) and Twenty Seventh International Conference on Software Engineering and Data Engineering (SEDE 2018).